Please note that this review is of an adult novel. 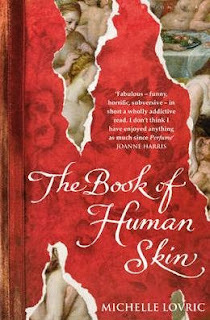 It's the question Minguillo Fasan suggests we ask ourselves as he begins his tale of torture, murder and human skin, so the Dearly Beloved Reader can't say she hasn't been warned. But Minguillo, the mad and bad son of a wealthy Venetian businessman, clearly assumes we will be enchanted by his company, even if it's against our better judgement. I know I was. The core of this darkly fascinating book is Minguillo's undying hatred for the sister - Marcella - who is the rightful heir to his father's house and fortune. That's a problem he resolves fairly quickly, but Minguillo's enmity is not satisfied by cheating Marcella out of her inheritance, and he is intent on spending his life destroying her. If Minguillo's evils had been solely related by other characters, his relentless malevolence might have been tiresome, but he tells us of his deeds himself, assuming the Adorable Reader's complicity. And he is very funny, as well as vile. Luckily for our sympathies (and probably our immortal souls), he is not the only narrator: there are four others - Marcella herself; the semi-literate family retainer Gianni; the saintly and skin-obsessed Doctor Santo Aldobrandini; and a nun who is raving mad and homicidal to boot. Skipping first-person points of view is notoriously hard to do without confusing the reader, but Michelle Lovric pulls it off brilliantly - I never once had to check back because I doubted whose words I was reading. The five voices are very distinct, and distinguished by fairly unobtrusive changing typefaces; their wildly varying stories weave together neatly for the ending. Maybe he's right, because I certainly couldn't put the book down. Or only in the very dark hours, when I'd begin to have horrible thoughts about its cover. Such an excellent review! Have this fascinating book on the reading pile, but by my armchair rather than up by my bed until I know it - and me - better. I remember the last TV Book Club panel really seemed astonished by the book and loved it, but it's other recommendations, such as yours, that convince me. This is a brilliant book. I loved it. A *wicked* book, in both senses of the word!